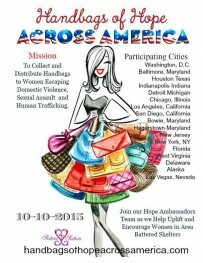 A survivor from the Delaware Coalition Against Domestic Violence WEAVER Task Force collected 31 beautiful handbags and a large assortment of toiletry items during the October 10, 2015 "Handbags of Hope Across America" Campaign. The SAFE and Abriendo Puertas programs were grateful to receive these handbags which they filled with donated toiletries and distributed to domestic violence survivors at each shelter. "This is a classic purse, I love it....thank you." "Oooh, I love all these purses, they are really nice." "Thank you, you mean I can keep it? Thank you!" "I really like this one, thank you so much." "Thank you -- thank you!" We are extremely appreciative and want to say thank you again for the work and time it took this WEAVER survivor to gather these donations. SAFE's Assistant Program Director, Jennifer Oppel added that "the outreach is a great way to not only remind women of their beauty, but also their dignity and independence".